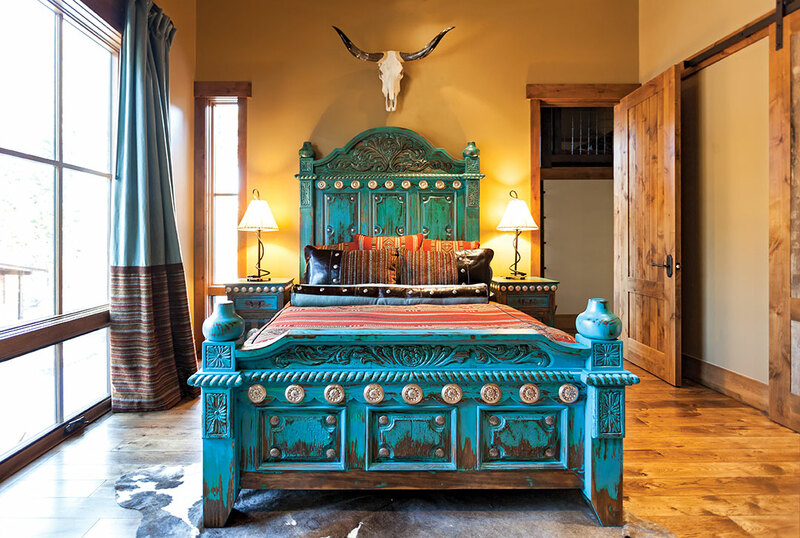 Build a home that evoked Austin, Texas’s charmingly rustic outdoor restaurants and bars, its uniquely southwestern style and its vibrant music scene. 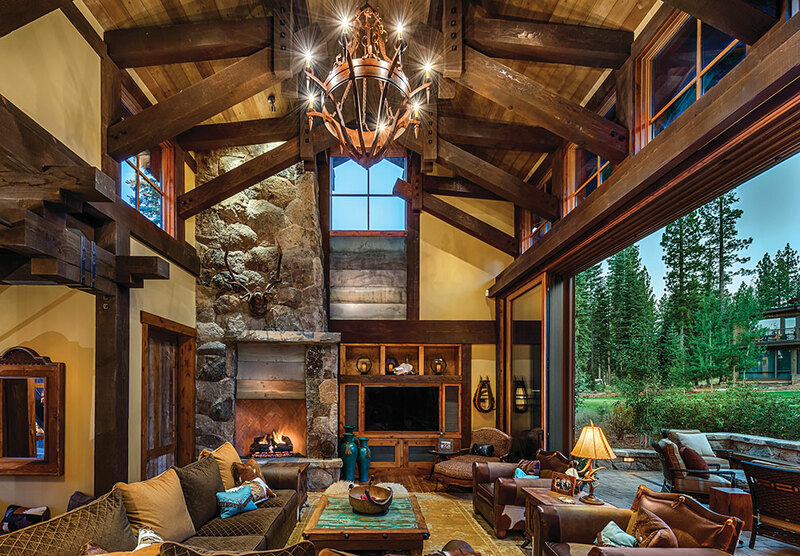 So went the charge architect Clare Walton and designer Diana Vincent received from the Texas-bred owners of the “Austin” Cabin in Martis Camp. 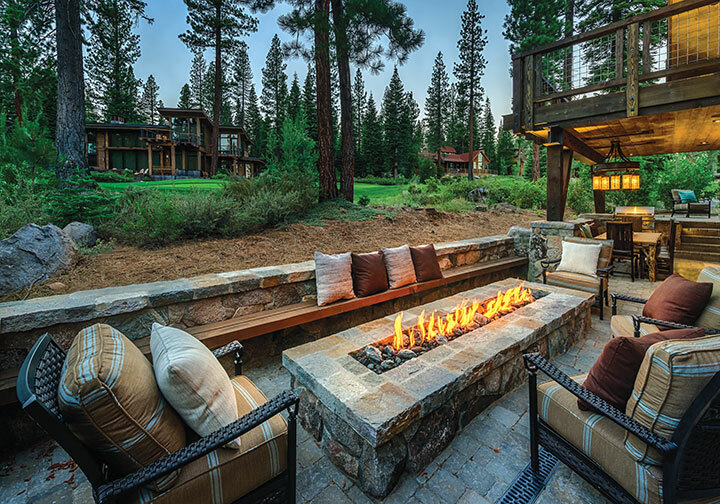 The homeowners—who have three sons and split time between Tahoe and the Bay Area—got their wish. The home opens into the great room, where a stunning golf course view through a collapsible window wall greets guests. Reclaimed picklewood siding and a stone-and-steel fireplace set the tone, and one could easily imagine a country band playing to a small crowd. A rustic, undeniably Texan feel infuses the great room: studs adorn leather furniture and cowhide-trimmed chairs and antlers immediately catch the eye. To achieve the desired Lone Star look, the homeowners turned to High Camp Home’s Vincent, formerly of Dallas. Walton designer Jennifer Loving proved integral to the process, and the team designed a house that hit its marks. One of the home’s true treasures is in a sleeping nook in the hallway to the upstairs master bedroom—a cozy space with closing curtains restrained by thick rope and a view down over the great room. “The sleeping nook was a creative way to turn a circulation space into a destination,” Walton says. 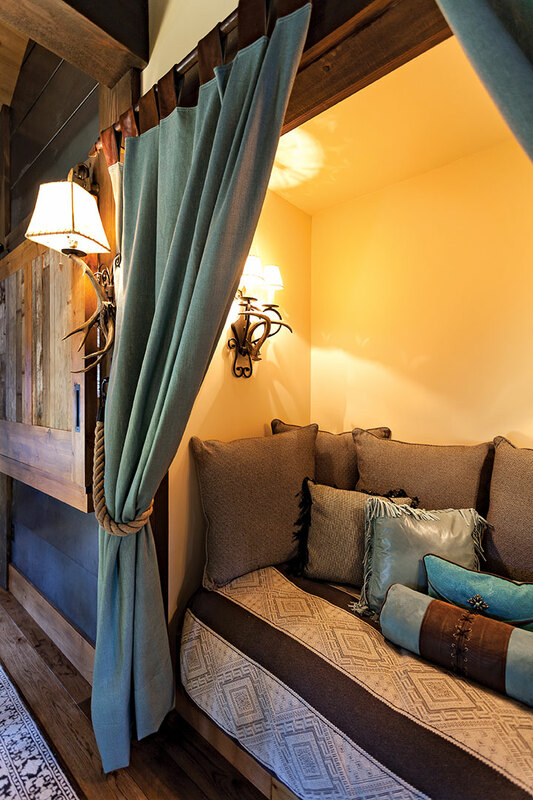 An adjacent sliding barn door opens the master suite to the same hallway. The master suite bathroom features a large copper tub and mounted leather vanity lit, of course, by an antler light fixture. “The house isn’t for the faint of heart,” Vincent laughs. Nor the delicate. Though TQ’s panel was assured the family’s three boys are definitely of the “Yes, sir” variety, the team designed the house with their needs in mind. An off-garage mudroom captures any debris that may follow them in and a rustic bunkroom allows them privacy. “The bunk room needed to be more than just a location for sleeping; it needed to be a place that could also function as a social getaway,” Walton says. The whole home seems just the place for an Austin-style barbecue party or crawfish boil—just book the band.